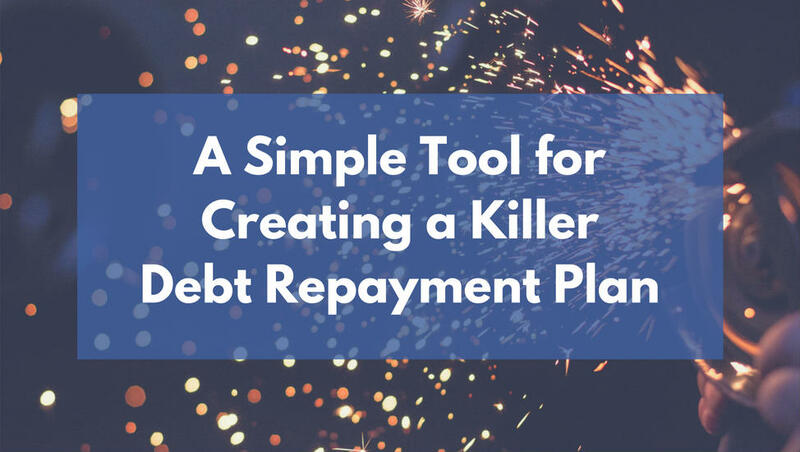 A while back I was helping a client create a debt repayment plan and I found a great free tool that I’d like to share with you today. If you have student loans, credit cards, a mortgage, or any other debt that you’re working to pay off, this tool will help you do it as quickly and effectively as possible. The spreadsheet comes with a full set of directions that you can follow to fill it out yourself. I’m not trying to duplicate those directions here, but I would like to give you a sense of how this tool will help. Here are the three features that I think are most helpful. This is where you enter the important information about your debts. This information is used for the rest of the calculations in the spreadsheet, but it’s also useful simply because it organizes everything in one place. As I talked about a couple of weeks ago, sometimes simply being aware of your financial situation is all you really need to make progress, and this is a big step in that direction. One of the most helpful pieces here is the Total line, which shows you both your total debt balance and your total monthly payment. One of the cool parts about this tool is that it’s easy to play around and see how making different decisions here will lead to different outcomes. This allows you to make a decision you actually understand and like instead of having to blindly trust “the experts”. As you can see, my last debt will be paid off in June of 2026 and I’ll pay $18,933.10 in interest between now and then. Now let’s say that I can afford to put an extra $200 per month towards my debt. How does that change the results? That extra $200 per month means I’ll be debt-free almost 4 years sooner AND I’ll save over $9,600 in interest. Pretty cool! You’d get to debt-free at the same time as the example just above but you’d save yourself about $300 along the way. It’s not a big difference in this example simply because the highest interest debts are also the debts with the lowest balances, so it ends up being about the same either way. In other situations the difference could be much bigger. I would play around with both of these variables to see how they affect your end result. Then you can make an informed decision based on actual numbers. Quick note: Do you want real answers to your personal questions about paying off debt and other financial issues? Click here to learn how to get them. The screenshot above is from the bottom part of the PaymentSchedule tab of the spreadsheet, and while it might look a little intimidating at first, what it’s doing is really helpful. This is where you can see exactly how much money you’ll put towards each debt every single month from today through your very final debt payment, customized to the specific strategy you chose in the last step. What this means is that you don’t have to figure out all these payment amounts yourself. If you simply make the payments each month exactly as they’re laid out here, you’ll get to debt-free right on schedule. This is especially helpful during the months when you pay off a debt. For example, in the screenshot above I make the final payment on Credit Card #1 in June of 2018, which means that my payments change in both that month and the next one. And instead of me having to run those numbers myself and hope I get them right, I can simply follow the directions here. All of the features above are very cool and very helpful, but of course you still have to use this information to take action. Without action, none of this will actually lead to anything. 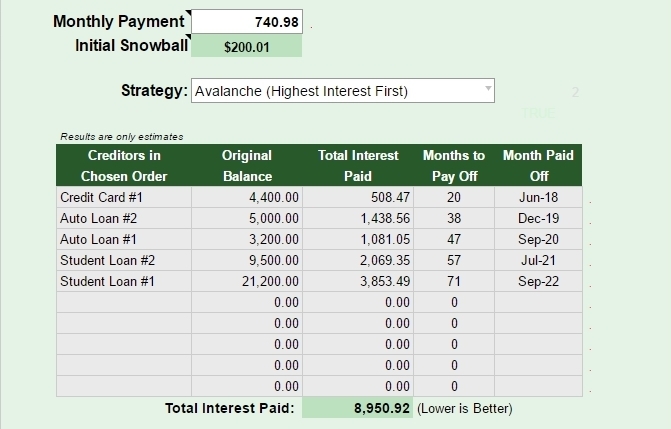 Download the spreadsheet and follow the steps above to create your initial debt repayment plan. Automate both your minimum payments and the extra payment you’re making towards whichever debt you’re prioritizing first. 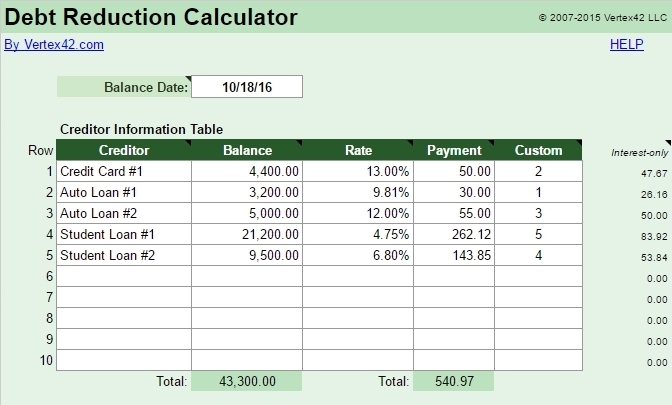 You can use the PaymentSchedule tab to figure out exactly what those amounts should be. Schedule a reminder using Google Calendar (or any other tool) to update your automated payments for all months where the PaymentSchedule indicates a change. Any time you make an extra one-time payment, need to pay less one month, or anything else about your plan changes, update the spreadsheet to reflect your new situation so you can update your plan. If you follow those steps, you’ll be well on your way to debt-free. And if you’d ever like a hand, a Jump Start Session would be a perfect opportunity for us to create your plan together. This is THE spreadsheet we used to pay off my wife’s $80,000 of student loan debt. It was so helpful and inspiring and motivated us to keep making extra payments and watch the date get closer and closer. Awesome! I’m glad to hear it helped Lance. My favorite spreadsheet tool as well! One thing I did to enhance this tool is to seperate each of my loans into seperate accounts. For a lot of people they have multiple student loans for 1 Student Loan Provider lumped into 1 total amount (and interest rate). I called my student Loan company (Great Lakes) and requested that each of my balances get linked together by interest rates. Now instead of 1 big account balance I had 4 seperate accounts based on interest rate. Nice Gary! Thanks for the tip. It’s definitely best to your loans by interest rate to make sure you can pay them off as efficiently as possible. Hi, I have more debts than the spreadsheet has room for (horrible I know haha). Is there a way for me to add rows? 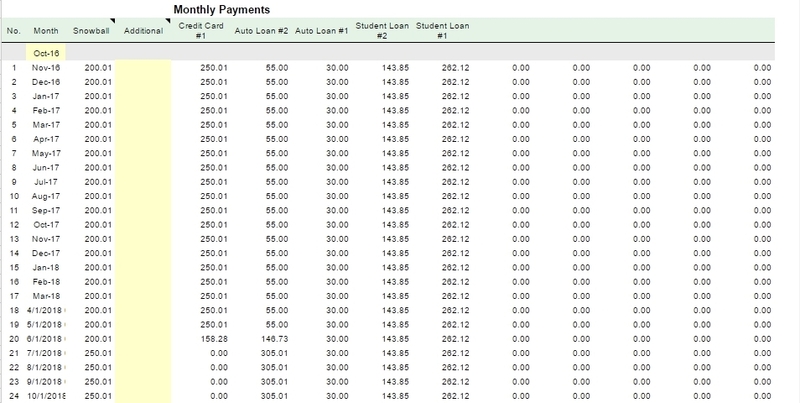 You can buy an extended version of the same spreadsheet that allows you to include up to 40 loans. It’s only $10, and you can find it here: https://www.vertex42.com/Calculators/debt-reduction-calculator.html. One of my entries has a payment that’s red and bold. Context tells me that’s bad, but I can’t find information explaining it outright. Anybody know? I’d love to try to help Stephanie but could you provide a little more context? Where exactly are you seeing this? You can also contact their support team here: https://www.vertex42.com/support.html#contact. That is definitely a unique situation Lori and unfortunately I don’t know of a tool that’s built to handle it. Maybe you could simply enter them as two different debts in this spreadsheet? I’m not sure if that would work but it’s the one thing that comes to mind. I don’t think it’s worth updating monthly. 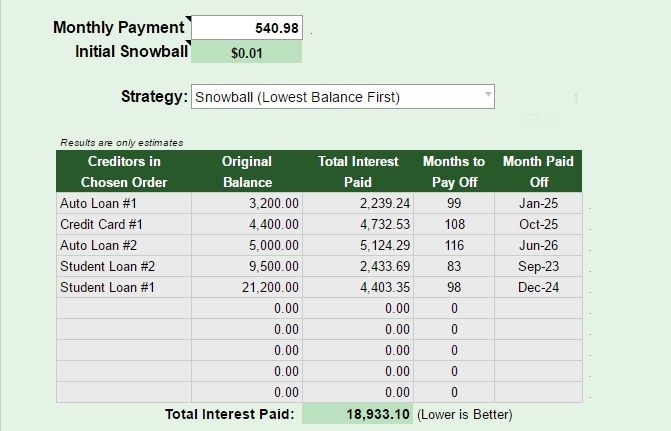 I would use the spreadsheet to create a repayment plan and then focus on implementing that plan. If you make a big one-time payment, miss a few payments, pay off a loan, experience a change in income, or there’s some other significant change in your circumstances, that would be a good time to update the spreadsheet and update your repayment plan.